Here at Cirque we have a number of VR systems (HTC Vive, Google Daydream, Samsung Galaxy Gear VR) that we play internally and we also invite friends and family of employees to come in and play. We've had birthday parties, scout groups, family parties, and a number of other large groups come in and play the systems. When groups come in we observe their experiences, talk with people about how they enjoyed it, and try to learn what we can about how to make the experience even more amazing. Thus far we've made a few observations. First, playing on the Samsung Galaxy Gear VR or the Google Daydream is fun and exciting for everyone for the first 30 minutes. Being able to move your head around and see the image in full 3D space is amazing. However, the controllers really fall short of convincing your mind that you are in fact in a different world. With either product you get into games where you want to directly manipulate objects in the virtual world, but you only have a single button as your main control. This requires games to be simplified to accommodate only basic interaction and it really simplifies and hurts the game play. The most typical use case is a game where you want to push a button or pick up an object and the controller image in the game is replaced by an image of a hand. In this case you use the trigger to move the fingers on the hand, either to pick up the object or to select the button when you are close. This is simply the only option, the game play demands a hand that interacts with the game and yet the controllers know nothing more than a button has been pressed or not pressed. From an immersion standpoint this quickly pushes your mind out of the virtual world and into a confused state. You've moved your head around, saw the amazing 360 degree views and started to believe that you were somewhere else. But once you try to truly interact with the environment you realize that you are only playing a game. The worst example of this is Star Trek: Bridge Crew. For any Star Trek enthusiast that game is incredible; to be on the deck of a starship is awesome. The visual experience is so cool that you can easily be tricked into feeling like you are actually flying through space. However, every time you use your hands to interact with the game you are reminded that your hands are in the real world, not the virtual world. You press a button to awkwardly mimic the opening and closing of the full hand and you move the controller as if you are moving your hand, but it just doesn't work for an immersive experience. However, when you play a game with a gun and you look at your hand in the virtual world you see the gun, pull the controller trigger and see the gun trigger move, and are convinced that you have escaped to a new and magical place. So for any game that requires a trigger, a controller in hand is perfect. 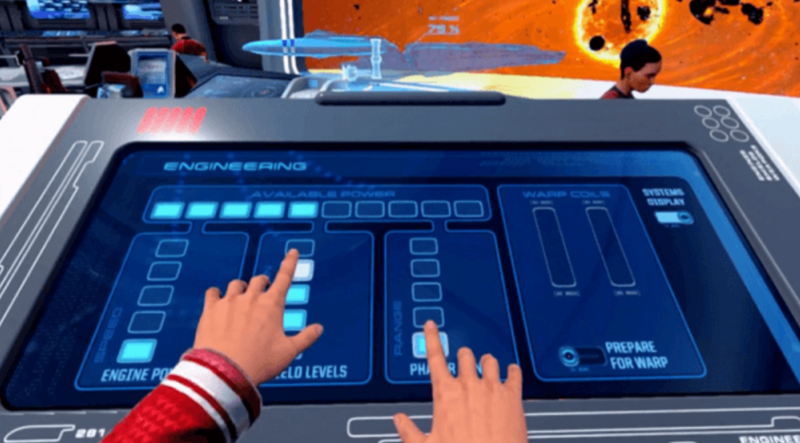 This has led us at Cirque to realize that VR requires hand sensing; you must be able to see the location of the fingers and project those into the virtual space. It would seem like VR tracking gloves are the ideal solution to this, but they also have many drawbacks. Many games also work best when you hold a controller that contains a trigger. To be empty handed has the same negative affect if the game requires a triggered controller. You want to pull a trigger but wearing a glove there is noting to pull, no tactile sensations at all. To best accommodate the need for both a trigger and hand position sensing we have developed VR Grip™ technology. With Cirque's VR Grip technology the position of each finger is tracked both on the surface of the controller and in free space. This allows the user to open or close individual fingers and see that motion inside the virtual world. This tracking is done on the grip of the controller itself which means that a physical controller is still available and this allows for a triggered controller for use in games that are most natural with a trigger. Cirque VR Grip demo hardware in a game with the hand closed on the controller. Here, the user has "opened" the hand over the surface of the controller, and the virtual hand reacts appropriately. By providing the best of both glove and controller input, VR Grip technology takes VR to the next level. It allows the user to more directly interact with the virtual world in a realistic and immersive way. By using capacitive sensing, and Cirque's unique design expertise, VR Grip sensors can be fitted to almost any controller design or shape. Controllers using VR Grip technology will be hitting the market soon. To learn more about how this solution could fit into your design, and to purchase a development kit, visit our VR Grip solution page.